The International 3D Society released a 3D revenue study today showing that 3D movie fans are driving opening weekend box office revenues by significant margins. 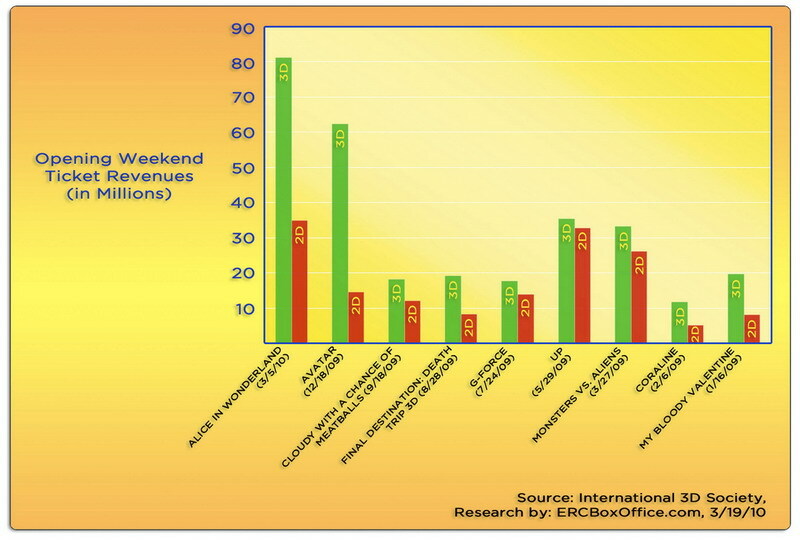 The report shows opening weekend 3D ticket revenues outpacing 2D ticket sales by margins of 2 to 1. The report states that Alice in Wonderland generated over $81 million dollars or 70% of its opening weekend gross revenues on 3D screens vs. $34 million in 2D domestic ticket revenue. The 3D to 2D domestic box office comparison was prepared for the Society by Exhibitor Relations, Inc. Moviegoers are purchasing 3D movie tickets by an almost 2 to 1 margin over 2D tickets. Avatar‘s percentages were even higher, the report estimates, with 80% or $62 million of its first weekend gross ticket sales revenues of $77 million generated from 3D theaters vs. $14 million in 2D theaters. The International 3D Society provides a community along with education and recognition for stereoscopic 3D professionals and is producing the 3D Technology Awards October 5. Society sponsors include Signature Sponsor, XpanD and Founding Sponsor, MasterImage 3D. For more information please visit www.international3dsociety.com.